Simply Spirulina is freshwater-sourced of deep-green algae rich in protein, vitamins, minerals, and carotenoids critical for great health and wellbeing. 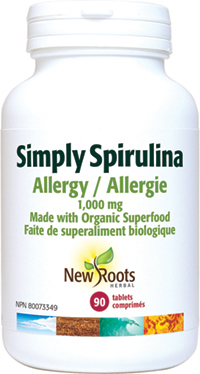 New Roots Herbal’s Simply Spirulina is the premium, powdered form of one the most complete sources of nutrition available. These freshwater unicellular organisms harness the sun’s energy through photosynthesis and assimilate virtually every vitamin and mineral essential for excellent health and wellbeing. New Roots Herbal’s Simply Spirulina is cultivated in fully closed, contaminant-free freshwater ponds, then harvested, freshwater-rinsed, and dried for a mild, natural flavour. New Roots Herbal’s Chlorella is an excellent source of vitamins, minerals, amino acids, proteins, and critical nutrients. Our Matcha Green Tea is of the first harvest and shade-grown. New Roots Herbal’s Peacegreens contains enzymes, vitamins, minerals, essential amino acids, vegetable proteins, antioxidants, phytonutrients, fibre, chlorophyll, and much more to help improve your energy levels and cleanse the blood.